St Isaac’s Cathedral is the main cathedral of St Peters­burg Eparchy. The cathedral is situated not far away from the Neva River on St Isaac’s Square. One of the first structures in St Petersburg was a wooden church. The church was situated not far away from the place where the Admiralty stands now. This church was sanctified on the 30th of May 1710. This date is the birth­day of Peter I and the day of St Isaac the Dalmatian. That’s why the church was called as St Isaac’s church. It was crowned with a little dome and a bell-tower with a spire. In this church Peter I married Catherine I in 1712. Then between 1717 and 1727 the wooden church was replaced by a stone one. The stone church had a dome and a tall bell-tower. It was designed by the architect George Mattarnovi. This stone church was located where the monument to Peter the Great stands now. But the building of the church was cracked and in 1763 it was dismantled. 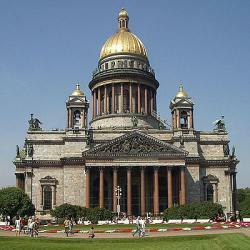 On the 8th of August 1768 the first stone of the new St Isaac’s Cathedral was laid. The construction of this ca­thedral was commissioned to the architect Antonio Rinal­di. The building lasted for a long time and couldn’t be completed. Paul I commissioned the architect Vincenzo Brenna to finish the building of the cathedral. Brenna changed the original design of the cathedral. And on the 30th of May 1802 St Isaac’s Cathedral was opened. But soon it was decided to replace this cathedral, too. It didn’t fit in with the splendid appearance of St Petersburg. In 1818 the building of the present St Isaac’s Cathe­dral was begun. The cathedral was designed by the ar­chitect Auguste Montferrand. It took 40 years to create this wonderful cathedral. The construction was completed in 1858. About 400 thousand people took part in the build­ing of the cathedral. Many of them were maimed and died. The construction of the cathedral required a lot of en­gineering solutions and specially designed equipment, for example, equipment for cutting and erection of columns of granite weighed 114 tons each. The columns were brought by specially built barges from Vyborg. The massive columns were made of mirror-finished red granite. The walls of the cathedral were made of brick faced with marble. The dome drum is crowned with a small tower with bay windows and a gold Greek cross. There are four corner towers with open belfries and small gold-plated domes. All four facades look alike. They are enclosed with great eight-column porticoes with triangular attics. The attics are decorated with high reliefs. The lower corners and the dome drum are embellished with statues of angels and sculptures depicting scenes from the Bible. They were created by the best sculptors and artists of that time, such as Ivan Vitali, Pyotr Klodt, Stepan Pimenov, Alex­ander Loganovsky and others. The interior of St Isaac’s Cathedral strikes by its wealth of decoration. Inside the cathedral was faced with the most beautiful stones such as malachite, lapis-lazuli, por­phyry, versicoloured marble and so on. The painted decorations and mosaics were executed by the famous art­ists. More than 200 paintings belonging to the artists like Fyodor Bruni, Carl Bryullov, Pyotr Basin decorate the interior of the cathedral. The huge cathedral 101.5 metres high, 111 metres long and 98 metres wide was opened and sanctified in May 1858. And it was the largest church building in Russia. St Isaac’s Cathedral became one of the most popular cathe­drals in the city. In 1931 the cathedral was turned into the museum, Now four times a year the services are held in St Isaac’s Cathedral.